Cisco has added cloud calling to its Webex Teams messaging app – something the company called a “significant step” in the integration of BroadSoft’s technology stack following the completion of this year’s $1.9 billion acquisition. The combination is designed to provide an “enterprise-grade” cloud-based PBX [private branch exchange] phone system in addition to existing message and document sharing features. The addition of calling to Webex Teams’ content sharing and messaging capabilities makes it a “single UC [unified communications] application, which was the original vision of UC,” said Kerravala. Earlier this year, Cisco merged its two collaboration platforms – Webex and Spark – into a single platform: Webex Teams. At the time, IDC research director Wayne Kurtzman described the rebranding as “not just marketing. It is a fundamental shift to include calling, meetings, video, collaboration and their in-room devices under what they perceive is their most well-known brand, Webex,” he said. At the Cisco BroadSoft Connections event in Florida on Tuesday, Cisco also unveiled a new calling app that integrates with Microsoft Outlook and enterprise directories. The Cisco Calling App lets users make voice and video calls from mobile devices and desktops running iOS, Android, Windows or MacOS. 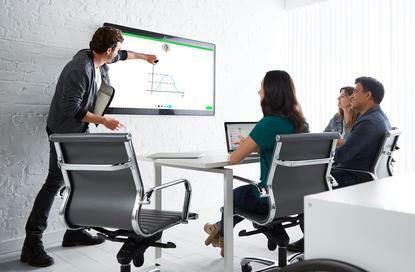 Cisco also unveiled new devices aimed at improving the “huddle” space meeting experience – citing research that claims there are more than 25 million such meeting rooms in offices around the world. The Webex Room Kit Mini video conferencing device is targeted at smaller meeting rooms, adding to the existing range of Webex Room Kit products. The device “wakes up” when it detects users entering the meeting room and adapts video to ensure all participants are visible on-screen. Meanwhile, the 55-in. Webex Board digital whiteboard received a software update, with browser access, sticky notes and “pinch and zoom” interactions. For larger rooms, Cisco also launched an 85-in. version of the screen. Finally, the company touted Webex Share, a wireless screen-sharing device that turns any TV or screen into a presentation device, connecting with Webex Meetings and Webex Teams. Kerravala said that meeting room hardware can often be expensive and hard to deploy, thus limiting the technology to medium and larger rooms. Devices aimed at smaller rooms should help widen the reach of video-conferencing tools.